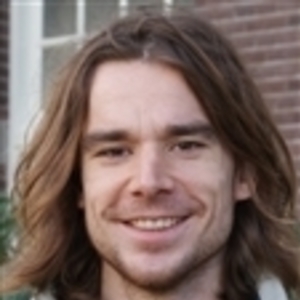 In the 1990s, Jim Bever developed a theoretical framework describing plant-soil community interactions mathematically. 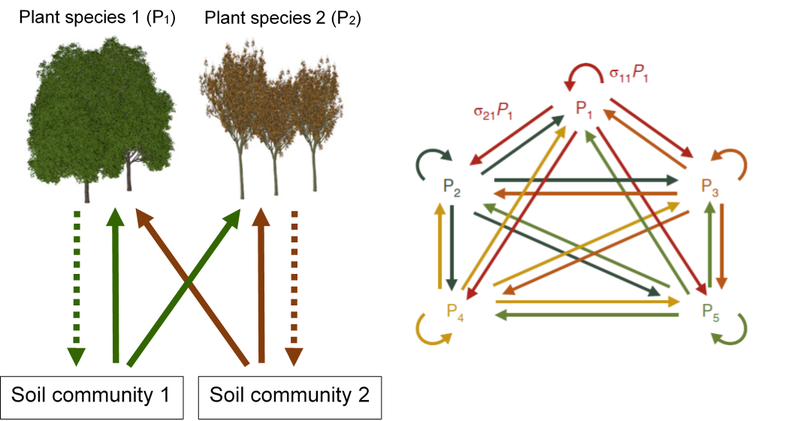 This framework is based on plant-soil feedback: each plant species stimulates the growth a specific subset of soil community species, which in turn affects the growth of the host plant and competitor plant species (Figure 1). A key result was that two competing plant species can coexist when this feedback, quantified by a so-called ‘interaction coefficient’, is negative. When the interaction coefficient is sufficiently negative, plant-soil feedback may even facilitate the coexistence of plant species that are strong competitors for abiotic resources. A major strength of the theory is that model parameters can be directly parameterized with data from pot experiments or the field. In this earlier work, however, the math had only been worked out for a system of two competing plant species experiencing plant-soil feedback. Figure 1: Left panel: The plant-soil feedback framework describes a two-step process in which 1): each plant species amplifies a specific subset of soil community organisms (dashed lines). 2) This subset affects the fitness of the host plant and competitor species (filled lines). Right panel: We can generalize this framework to multiple species (here, five species are used as an example). This creates a network in which each species, through modification of the soil community composition, influences itself and all competitor plant species. Then, in 2013, Jim and I got a great opportunity to start a NIMBioS (National Institute of Mathematical and Biological Synthesis) working group (Fig. 2) that partly focused on extending the plant-soil feedback theory to more than two plant species. In our Nature Ecology and Evolution paper ‘Frequency-dependent feedback constrains plant community coexistence’, we present a general equation for the interaction coefficient, which not only applies to the 2-species case, but to plant communities of any number of species. We are excited about the fact that even a near-infinite number of feedback loops can always be represented by a single number, representing the net feedback generated within the entire plant community. As previously observed in the two-species case, we discovered that negative community-level feedback is a necessary condition for plant species coexistence. Figure 2: Members of the NIMBioS working group in plant-soil feedback theory (Back row, left to right): James Umbanhowar, Scott Mangan (via Skype), Jim Bever, Maarten Eppinga, Keenan Mack, Jonathan Bauer. (Front, left to right): Dan Johnson, Jiang Jiang, Allan Strand, Karen Abbott, Mara Baudena, Liza Comita, Kerri Crawford. Not on this picture: Katie Suding. Together with Mara Baudena, we mathematically derived this community-level feedback. Together with Jiang Jiang, Keenan Mack and Allan Strand we also performed simulations comparing the community-level feedback to the previously used pair-wise averaged metric. This comparison showed that when host plants are much more strongly limited by their own associated soil organisms than those cultured by competitor plants, the pair-wise averaged metric correlates well with the community-level feedback. This type of plant-soil community interactions has been inferred (using observational data from adult trees and seedling densities) in North American deciduous forests in a previous study led by Dan Johnson (Figure 3). 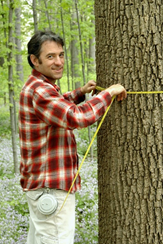 Figure 3: Co-author Dan Johnson was part of the massive effort of the US Forest Service’s Forest Inventory and Analysis to monitor forest diversity on a continental scale. In the current study, we tested theory using more than 200,000 forest plots from this dataset. Together with Dan, we took a fresh look at these data using our extended theoretical framework in the current study. Specifically, we could verify that variation in feedback observed in eastern US deciduous forests is indeed strong enough to explain the observed variation in tree species diversity in forests east of the 100th meridian. As the number of plant-soil feedback experiments is rapidly increasing, we think our extended framework provides a promising tool to explore the consequences of these empirically measured effects for plant community coexistence. Finally, we would like to extend a big thank you to NIMBioS for making it possible to initiate this project. To be able to meet with working group participants in Knoxville not just once, but four times between 2013 and 2015 was crucial to getting to the bottom of the intriguing problem of how to quantify community-level plant-soil feedback.